When the sirens go off and a tornado warning is issued there are only a few precious moments for you and your family to seek safety. 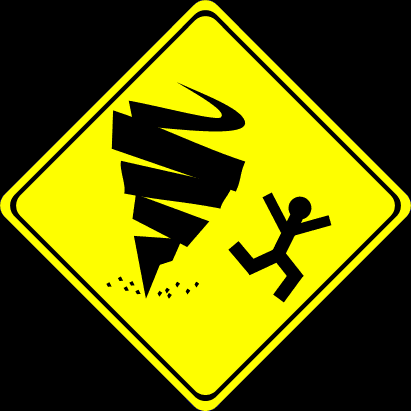 With all of the tornado myths circulating it's important that you know accurate tornado safety facts and tips. The idea of this section is to empower you with the knowledge you'd need to have the best odds at surviving a tornado. Hopefully you'll never need to use the information you're about to read, but if you do hopefully it will save your life. Tornado Watch vs. Tornado Warning - Different between a tornado watch and tornado warning. How to Prepare for a Tornado - The proper steps to prepare for a tornado. Knowing the difference between a tornado watch and a tornado warning is critical. A tornado watch means that conditions are right for the formation of a tornado within the area or region under a tornado watch. When a tornado watch is active in your area you'll want to be alert and ready to seek shelter if a tornado develops. A tornado warning means that a funnel cloud has been sighted or that weather radar has detected the possible formation of a tornado. A tornado warning means you need to ACT NOW and SEEK SHELTER immediately. A tornado warning means imminent danger to property and the potential for serious injury and loss of life. Proper preparation should happen long before a storm rolls in that could produce a tornado. You'll want to first learn what your local community uses for a tornado warning system. You can easily find this out by calling city hall or city's emergency management department. The majority of cities use an audible warning via an outdoor siren. You should identify the safest room in your household for you and your family to gather during a tornado. The best location is the basement or storm cellar, if you don't have either of those choose an interior room, that doesn't have any windows. To make sure everyone in your household knows what to do it's smart to have periodic practice doing tornado drills. These drills should be designed to educate everyone in the household on what to do and where to go if a tornado warning is issued. If you have advance warning of a powerful storm it's smart to secure or lock-up items that could become projectiles; trash bins, lawn furniture, children's toys, etc. Keep all of your trees trimmed and remove any dead, dying or diseased limbs as they can easily breakoff in high winds and cause damage. During a storm you'll want to keep your attention on the local news or a NOAA Weather Radio. This can help you stay informed on storm and bring any tornado watches or warning to your attention. You'll want to do everything you can to protect your family, houses can be rebuilt, property can be replaced, but you can't bring back loved ones.